A major safety benefit that would derive from the proposed Colonie Village Connector would be diverting bicycle traffic from the Central Ave./I-87/Wolf Rd. danger zone. John Gillivan, village resident and bicycle advocate, obtained a grant to conduct a family bicycle rodeo in Thunder Park with a “pop-up” bicycle lane on Locust Park – one of the linking roads. This event demonstrated to enthusiasm and support that would derive from the Village of Colonie expanding its bicycle facilities. Mayor Leak, while we recognize that segments of the proposed linkage have a project life of their own and that some segments – notably Rapp Rd. – are barely rideable, action by you and the Village of Colonie to install bicycle lanes on Petra/Walker/Jupiter may well encourage other officials to take steps to hasten improvement of these interconnecting segments. Sincerely yours, Albany Bicycle Coalition, Inc.
Rapp Road – The section from the railroad tracks at Petra Ln. and Lincoln Ave. to the Six-Mile Trail (0.7 miles). This road is narrow, winding and in terrible condition with no accommodation for people walking or riding. The Albany Bicycle Coalition has a separate campaign to address this situation. Six-Mile Trail – The Six-Mile Trail joins Fuller Rd. at the roundabouts to Rapp Rd. at the Solid Waste Management Facility. This multiuse path falls under the Albany Department of Water and Water Supply. The Albany Bicycle Coalition has worked successfully with that water department and with Albany’s Department of General Services to have signs installed at the ends of the multiuse path to guide route access (in process – 1.3 miles). Sand Creek Road – Major suburban arteirlal. No plans at present to add bicycle- or pedestrian-friendly facilities. Filed under Activisim, Albany-Colonie Connector, Fuller Rd. Washington Ave. Flyover – A Call for Change – In fall 2012, the long awaited “Flyover” to route through motor vehicle traffic from Washington Ave. to the Washington Ave. Extension was completed. This and the accompanying series of traffic circles on Fuller Rd. were clearly designed under an “all cars-all the time” philosophy. These means that people on bicycles who want to travel on Washington Ave. and its Extension, on Fuller Rd., on the University at Albany’s “purple path,” and on the Six-Mile Trail must be in the Advanced/Experienced “Strong and Fearless” or “Enthused and confident” 1 percent category. The following letter calls for the New York State Department of Transportation to revisit this area and to modify it to accommodate people on bicycles. Here are some earlier rider assessments. RE: Washington Ave. Flyover at Fuller Rd. This is to seek your assistance in clarifying safety concerns of the Albany Bicycle Coalition and of people on bicycles who use Washington Ave., Washington Ave. Extension, and Fuller Rd. Because of our advocacy role in the region, we receive questions and comments about riding conditions. One common area of concern is navigation of the Fuller Rd. traffic circles, the Fuller Rd./Washington Ave. intersections, the Flyover, and bicycle travel on Washington Ave. Extension. 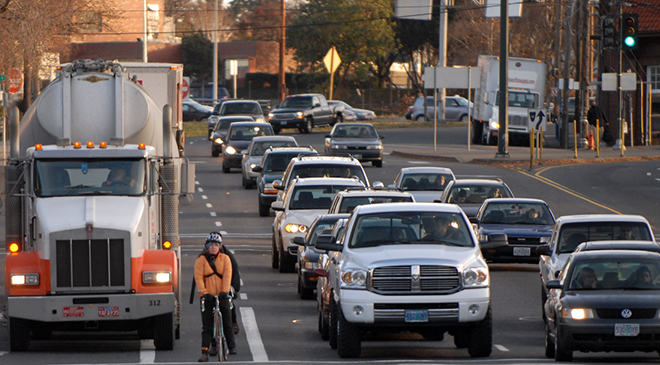 As you are aware, fear of riding in traffic is the single, major impediment to bicycle travel. This is nowhere more apparent than in those spaces where motor vehicle movement was the paramount design feature. In response to these concerns, we formed a study group to develop questions and recommendations about these specific roadways. We are at the point where we need advice from you or members of your staff on what are feasible treatments for this Washington Ave.-Fuller Rd. area. I am asking that you arrange for our group to meet with you or staff for a learning session where we can articulate our concerns and our ideas. I am enclosing some specific ideas that result from our site visits and deliberations. Because several of our members work during the day, it would be helpful to have such a meeting at the end of or after the businesses day. This meeting could be augmented by site visit(s). Bicycles Ahead Signage – Place several signs near the merge areas on both Fuller Rd. and Washington Ave. (Share the Road, Bicycles In Lane, etc.). Of particular emphasis is the on ramp to westbound Washington Ave. Extension from southbound Fuller Rd. Bicycle Lane Markings – Install conventional bicycle lane pavement markings on the Washington Ave. “flyover” shoulders to designate clearly where the people on bicycles should be riding. These markings will instruct both cyclists and people in cars. Bicycle Lane – Install “Bicycle Lane” signs near and at both entrances to the Flyover. Intersection Crossing Pavement Marking on Westbound Washington Ave. – Install crossing markings (e.g., dotted green and white) in the median to guide people on bicycles from the proposed bicycle lane on westbound Washington Ave. to the proper lane to continue west on Washington Ave. Extension. This will (1) alert people in cars to the presence of bicycles and (2) guide cyclists away from the tail of the merge lane (where they would risk conflicts with both the through motor vehicles and the merging motor vehicles). Shared Lanes Markings – Install Shared Lanes pavement markings on all lanes leading to and from the flyover. Walk Your Bicycle Assist – Install enhanced walking instructions for those people on bicycles who prefer not to navigate by bicycle the multiple traffic circles to access the Six-Mile Trail, Washington Ave., the University at Albany campus, or Fuller Rd. Ensure continued diligence to maintain and clean the sidewalks, curb cuts, and pavement markings/signage. Filed under Activisim, Albany-Colonie Connector, Fuller Rd., NYS DOT, Washington Ave. The Washington Ave. Flyover and Related work is complete. Two cyclists gave their opposing thoughts on the results. What are yours? From a Daily Washington Ave. Extension Commuter – I am VERY deeply concerned. I suspect it is going to force me to change my route entirely to avoid it. I go west on Washington. If I take the flyover, I have cars and garbage trucks coming onto Washington westbound at 55 mph on my right on the on-ramp from Fuller while I am stuck between them and the other traffic doing 55 mph on my left. This is almost certain death. If I get off Washington before the flyover and go down the ramp, around the circle, and back up the ramp, I have to assert my right-of-way over the commuters coming south on Fuller Rd. and into the circle while I’m there. This also strikes me as a death-defying experience. I cannot say for sure because I have not tried it yet, but I expect this whole thing is going to be a HUGE disaster for my commute. I think the design is terrible for cyclists and sets us back instead of moving us forward. It makes one more place no normal cyclist will ever dare go. From an Experienced Road Cyclist – I took a ride . . . through the university and along Washington Ave. Extension. I do like the new configuration at Fuller Road. It was easy to do the traffic circle and then the flyover. The condition of the road surface at that intersection is much improved, needless to say. And I do like traffic circles. I think they are fun and despite what others think, I say safer. Traffic certainly does need to slow down in order to negotiate and this seems to give equal advantage to the cyclist. [The result] could be cumulative as numbers of cyclists increase. You can’t get anything past me. Okay so maybe you can, but as soon as traffic cones it the pavement I am on it. Check out this video and then come back. I know right! They are finally starting construction on the pothole filled, broken pavement riddled, flip your bike over monster that is Fuller Rd. Also did you notice in the video that the words “bike lane” came up. I can’t confirm any of this, and I put a call into the Department of Public Works and the news organization that ran the story for more info since I checked their website and it has not been updated in a while. In fact it says that construction was not to begin until November. So keep your fingers crossed that we come out on top with this one. If anything I am glad that they are going to fix the potholes.